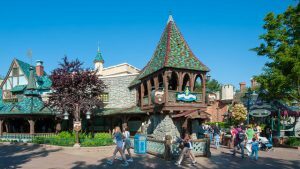 Fantasyland is a great place for children to be fully immersed within classic Disney stories, use their imagination, and explore the happiest place on Earth. 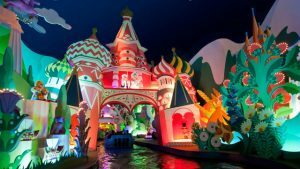 This classic ride can be found in all of Disney’s amusement park and is ideal for all ages. Average waiting time is often less than 10 minutes, FASTPASS is not available on this ride. Sore into Neverland on this ride modeled after Peter Pan’s journey. Ideal for any age but people prone to motion sickness should be weary. Average waiting time for this ride ranges from 50 minutes to an hour and a half and the FASTPASS option is available. 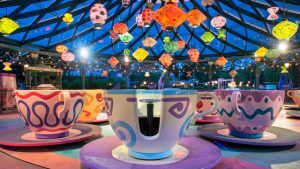 This popular attraction features teacups modeled after the tea set that the Mad Hatter used in Alice in Wonderland. An attraction that is available for all those who wish to join in on the tea party, but is not ideal for those prone to motion sickness. Average waiting time for these tea cups ranges from 5 to 15 minutes, and no FASTPASS option is available. 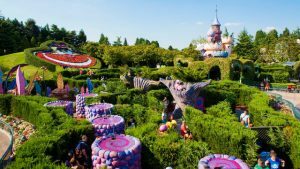 It’s a hedge maze based on Alice in Wonderland. The goal is to reach the Queen of Hearts’s Castle to have a view of the Fantasyland. While walking through the maze, you will meet some of the famous characters and get sprayed with water.